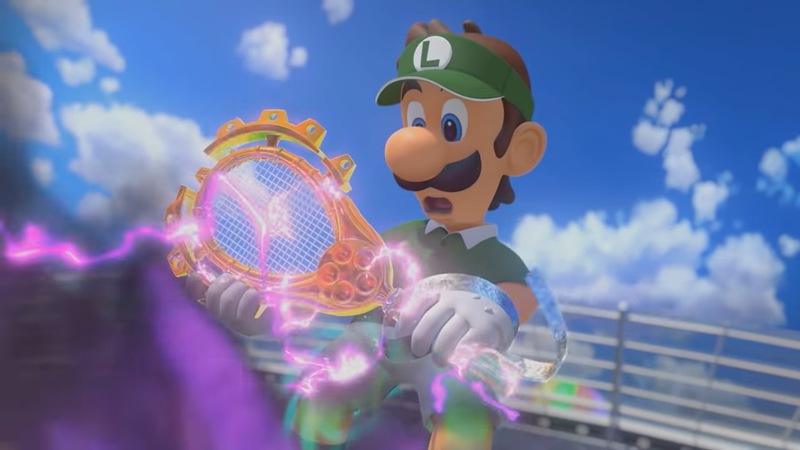 Luigi has a fairly significant role in Mario Tennis Aces’ story mode. Its his actions early on that lead to things spiraling out of control, and he appears later on as well. Camelot president Hiroyuki Takahashi and vice president Shugo Takahashi along with Nintendo producer Toshiharu Izuno spoke about Mario Tennis Aces’ story mode in-depth in a recent issue of Japanese magazine Nintendo Dream. Hiroyuki mentioned that giving Luigi a larger focus would help accomplish the goal of surprising players and that “Mario would be burdened with a sense of sadness for his brother that’d come from a pretty deep place.” He also mentioned that there was difficulty in balancing the story with gameplay. Why is Luigi featured so prominently in the story? Is there a specific reason for that? HT: That… Seems like it’d be a challenge to write, doesn’t it? HT: I wanted the story to have an element of surprise to it! I’d eventually conclude that having Luigi – who’s usually stuck in his brother’s shadow – fill a larger role would be surprising enough! Writing Mario was a bit complicated too. It’s easy enough to understand Mario’s relationship with Princess Peach; it was his relationships with the other characters that were a bit more difficult to expand upon. Of course, among them you have Luigi, Mario’s precious younger brother – but what about everybody else? How would Mario interact with the world? He really is a thought-provoking character. That’s interesting, it’s quite the deep subject. HT: I felt like as he set out on this next adventure, Mario would be burdened with a sense of sadness for his brother that’d come from a pretty deep place. Even when I saw the opening movie for the first time, I felt that it’d come as a big shock to a lot of people. ST: It looked like Luigi and the others had been wrapped up like the grip on a tennis racket! HT: Not only were they wrapped up and taken away, but it looked like they had become evil versions of themselves! I thought that something like that would definitely catch peoples’ attention. So, there was a purpose behind it being the way that it was, aside from simply being an opening cinematic… I see. HT: In all of my previous Mario-adjacent works, I haven’t written a story in which Princess Peach gets kidnapped. As for why this game’s story is so unique… The whole “Mario goes on a journey to rescue Princess Peach from Bowser” rigamarole is fine in and of itself, but how could that be resolved through sports? HT: I wondered if something as leisurely as sports would be a good backdrop for all of that! (laughs) I figured that if it could be played alongside any other Mario game it’d be fine. After I considered all of that, though, I had to actually write out the story. A difficult thing, too – there’s a delicate balance between gameplay and story that you have to strike. In that sense, it’s almost more difficult than writing a novel! Fortunately, I’ve written scenarios for quite a few RPGs, so I think it turned out fine. (laughs) I honestly think this game’s story is not unlike an RPG. ST: Even as a Mario Tennis game, the story definitely feels like something Camelot made! TI: The game’s ending, too – ah! I can’t say too much. (laughs) I’ll just say it was as I expected. More: Camelot, Hiroyuki Takahashi, interview, Mario Tennis Aces, Shugo Takahashi, top, Toshiharu Izuno.